My Parents enduring one of the hottest Spanish summers for a while! This picture says it all about our first couple of weeks of our Summer cycle tour. Spain has been in the grips of a heat wave. This part of Spain is often in the 40’s in July, but this year temperatures have soared into the mid to high 40’s. We set off from Vejer de la Frontera on 9th July with a three month plan to wonder around Spain, then cross France, ending up in Chamonix in the French Alps in late September. The map shows our projected route, with the red line being our first two weeks. Early days were OK, but by the time we reached Sevilla the heat had really kicked in. So cycling days were shorter, and Sylvia had to kick me out of bed for an early start. Generally we have coped with the temperatures, except for one hard day climbing the Sierra Morena. Ski touring these days puts so much emphasis on ‘fast and light’. Don’t get me wrong, I’m a firm believer of this practice and will try to cut out most items that I don’t need on an everyday ski tour. There are, however, some items that are essential to your back pack that can’t be left at home. With these ‘mandatory’ items I try to cut down the weight or find alternatives that can be used in their place. The pack I have dissected below is what I would take for a glaciated ski tour where I am unsure of the approach conditions but has no real technical climbing. It is not a ‘recommended’ list of items and it also excludes any extra items of clothing but it is what comes with me everywhere I go! Cilao harness. Its a fine line between comfort and weight when it comes to mountaineering harnesses. This French made, 135g harness fits in my pack nicely and I can wear it under my pants for a comfortable minimal fit. Petzl Ride ice axe. New this year these short, curved, alloy axes are great for Ski-mo. Having a steel pick they can bite in ice and paired with a trig grip make them a great all round tool. Weighing in at 275g I often carry two for good measure. Tranceiver. I used to carry a light single antenna transceiver but after reading stats about their performance I upgraded last year. Its all well and good having a light one but if you can’t find your friends in a slide then whats the point. Gloves. I usually carry a pair for up, and a pair for down. Petzl make a great leather glove that can tackle most rock without falling apart, paired with my Salomon Goretex glove for the way down or if it gets too snowy I’m covered for all occasions. Ski crampons. I used to not bother with these. But for the sake of 200g in the bottom of the bag you barely notice they make all the difference on a long and icy ski track. Gram for gram worth the weight! Poles. I use the Salomon Carbon S3. Light and strong these adjustable poles have great long grips that make traversing easier. Crampons. I mostly use the Camp X450. A lightweight alloy crampons that I like to beat up in the rocks. No anti-balling plates can often be frustrating, but at 450g for the pair I turn the other cheek. Shovel. For the last 4 winters I have been carrying around a 800g monster. I now carry around the carbon alternative that shaved 500g from my pack. At 295g this is the lightest shovel you would want in your pack as it actually still works to move snow! THE BAG! I squeeze all this and more into the Xalp 30. Designed for this sort of thing it has been well thought out. It has a separate compartment for your crampons/rope. 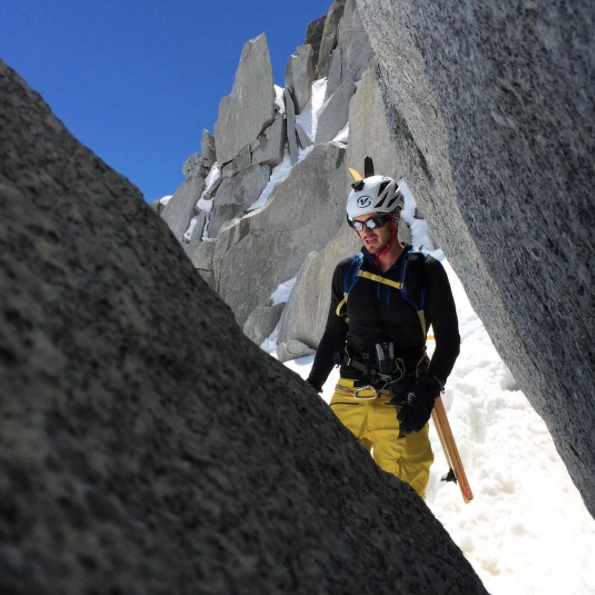 2 ice axe loops, and the best ski carry system that saves time. I can go a whole day without taking off the waist strap but still getting in and out of the bag. 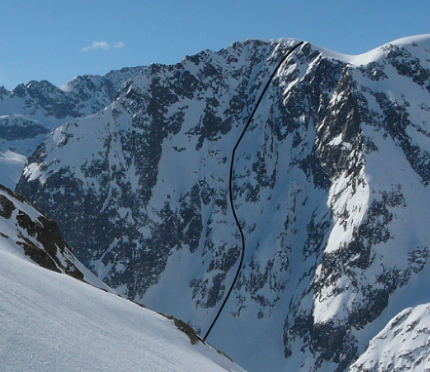 A great feature for anyone who has tried to get in their bag at the top of a 55′ couloir! First Aid Kit. This has all the essential plasters and bandages as well as pain killers, a multi-tool, wire and cable ties for repairs and a head torch. Your eyes are key! Sunglasses, goggles and a spare lens always come in my bag. Its great when you can see! My go-to touring ski. Salomon MTN Explore 95 with MTN binding. 1750g it is a great all mountain tool. floats in powder and holds an edge on 50′ boiler plate. Water. 500ml does me for most days. 1L if its hot or more than 5 hours. Food. Snickers, cereal bars, energy gels, whatever I can find in the cupboard as I rush for the door! Mainly just calories in some form or another. All of this kit fits in the 30l bag with space for a down and a shell layer. the bag weighs just over 4.5kg with everything in. Not the lightest but far from the heaviest but it has everything you need. My adventurous parents and their 6 month cycle around Argentina! And all went well, with a bit of Spanish usage we were booked on the Monday bus to Salta and our bikes deposited with the cargo handlers, which gave us a free day in Buenos Aires. Neither of us are city people and a few hours was enough for us to take in the sights. Wales is renowned for being wet. What did you think keeps the hills so green! I think the trick is to not let the rain get to you and to get out and make the most of the day reglardless of what the elements might throw at you. With this being said I have been back in Wales for a few weeks now and have only got up on the mountains a handful of times. After running the marathon earlier in the summer I have been trying to keep up my running fitness along with combining running with scrambling to keeping my alpine agility skills. 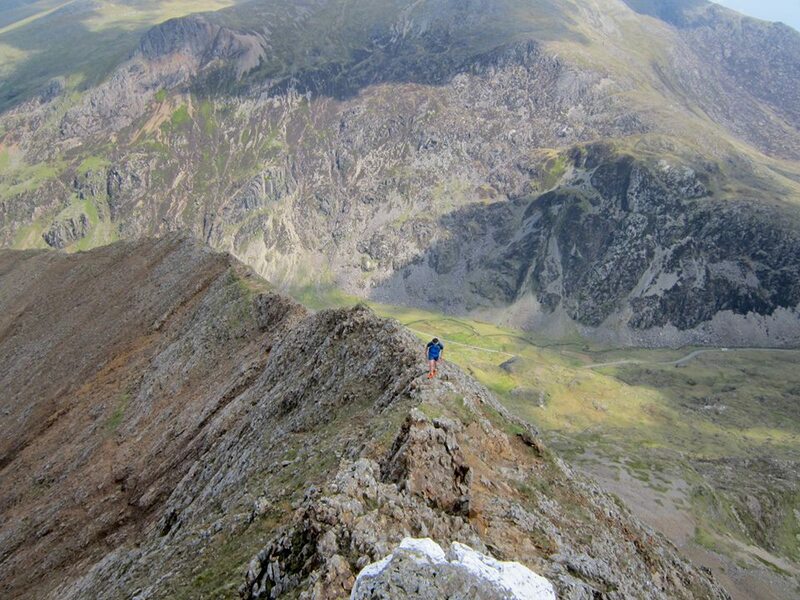 North Wales and Snowdonia is a great environment for practicing the art of alpine running. With narrow ridges like Crib Goch and more technical fast scramble found on Tryfan there is plenty of choice for all weather. Returning to Llanrug alone in mid July I had a week before my girlfriend arrived so I was determined to get some long solo days out in the mountains. My friend and ski/climbing partner Ally Hurst introduced me to the Snowdon Horseshoe in May and ever since has been reminding me that it can be done in under 2 hours. This is my goal for the summer. SO far I have had 3 attempts but all have been in wet weather. The first one being just under 3 hours then bringing it down to 2h20m. 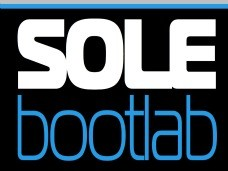 I am waiting for a nice dry few days and some fresh legs to go for my sub 2 hour attempt. I will keep you updated when this happens! North Wales is also renowned for its amazing quality rock climbing. I have not climbed outdoors in Wales before as I only developed an interest in climbing when I spent my first summer in Chamonix 4 years ago. My friend and Trainee guide Dave Searle is also spending the summer in Wales in preparation for his first guides scheme test in September and has been showing me and my girlfriend around and teaching me how British people climb, without the need of fixed anchors and bolts! With the weather being rubbish most days in the LLanberis pass Dave took me out to the well know climbing mecca of Gogarth on Anglesey. Arriving to the top of the sea cliffs with 40mph winds tearing over the top was not the most welcoming but regardless of the conditions we were ready to climb some rock. 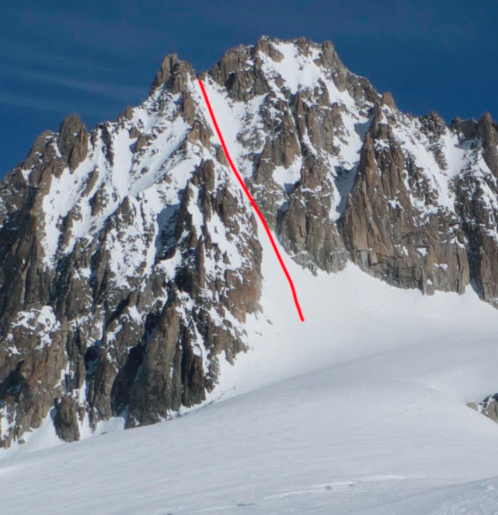 The thought of abseiling into routes never crosses my mind when climbing in Chamonix as you usually abseil off after climbing something so it is usually the last thing in my mind. I am not a great fan of Abseiling at the best of times, let alone when you are going backwards off a blind cliff, towards the sea, with a 40mph wind whipping the rope around. Safely down at the belay with the strong waves crashing meters below we started up the face. The rock was superb and the climbing varied and nothing like I have climbed in the Alps. I was lost in the moment and completely forgot about the sea below. I was loving it! Me, terrified, but loving it! Moving around to the Gogarth crag after this I was excited to get another route in. Escaping the wind my nerves calmed and I started to enjoy myself even more. Since winter finished I have been back in Wales for a few weeks doing a little running and working in Snowdonia. It is a great place to get some training in for the Mont Blanc Marathon which I signed up for months ago and it sure came around quickly! Arriving back in Chamonix in early June I spent a few days up high on my skinny skis enjoying the last of the spring corn. Mainly this was just spent touring around the Aiguille du Midi and a quick jaunt up the Tour Ronde with Pete. This was great to re-aclimatise and get back into the high mountains. 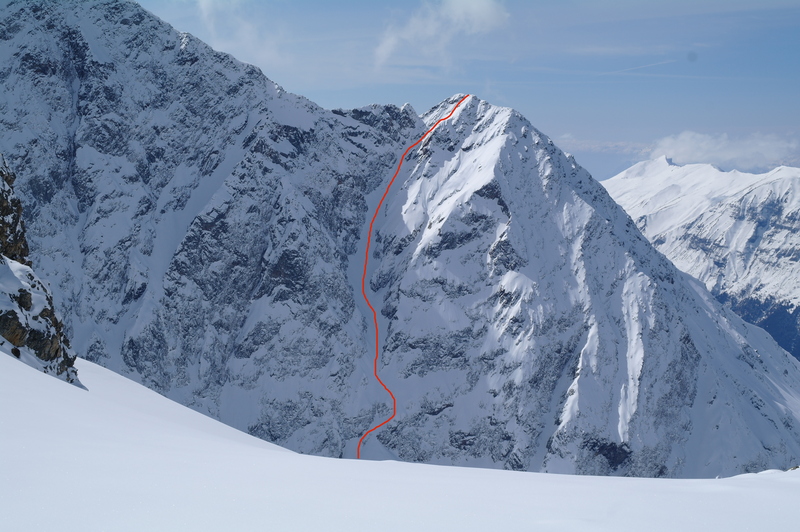 When the Flegere ski area reopened for the summer this meant the Aiguille Rouge was easily accessible again. Heading up the Crouches-Berrard traverse with Dave Searle and Pete we went fast and light and enjoyed running around in the snow and traversing this classic ridge. As the month of June was coming to an end this meant the marathon was close! I will am honest when I say I have only been on 4 worth while training runs ranging from 9-16miles. Entering the Marathon I was originally planning just to finish, to see if I could complete the big task ahead. After running some of these training runs in fairly good time I then set myself a goal of 7 hours for the 42km with 2750m of height gain. The nerves were felt in the morning but after a 7am start I just focused on the race. Getting off to a good pace I felt strong for the first half. After loosing some time on the big descent around the 15mile mark I had dropped 200 places. 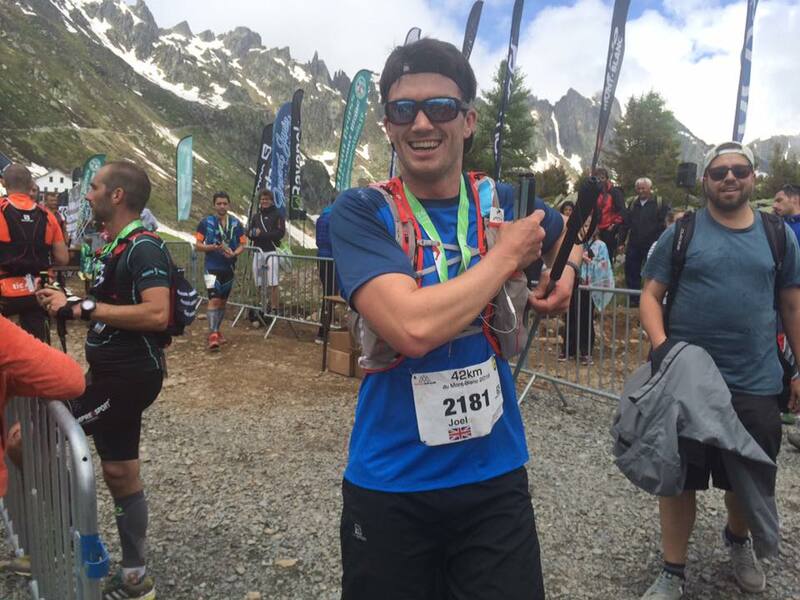 With the final long push back up to the finish at Brevent I gained almost 180 places and finished in a time of 6 hours 54 minutes. 659 overall place out of 2650 and 355 out of 981 in the senior mens. I am really proud of my time and I might be tempted to run again in the future, but might train some more before the race! I am heading back to Wales for the summer so will be doing a lot more running and some Welsh trad climbing, before returning to Chamonix for the Winter. After a week away in Corsica I was keen to get straight back out into the mountains. Seeing that Pete and Grant had skied the Tour Ronde North Face the day I arrived back and reported great snow I knew it was the time to go and bag this classic I had admired for years. The Tour Ronde is the first mountain I set my eyes on climbing on a summer trip to Chamonix 5 summers ago. 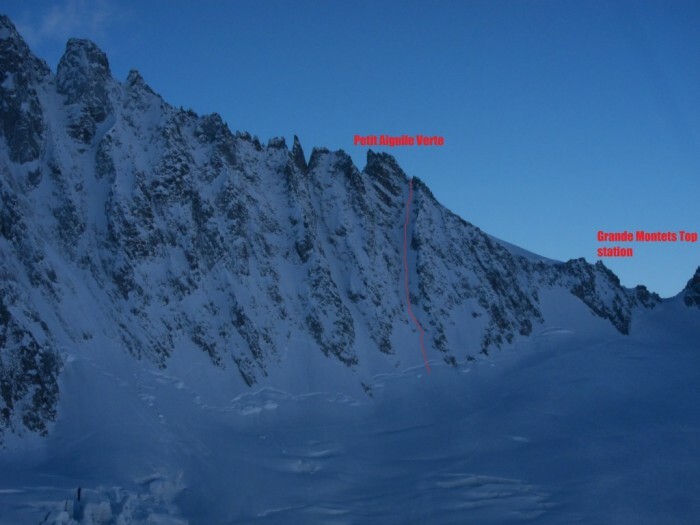 When I climbed its north face for the first time in 2013 I was over the moon and have dreamt ever since of skiing it. 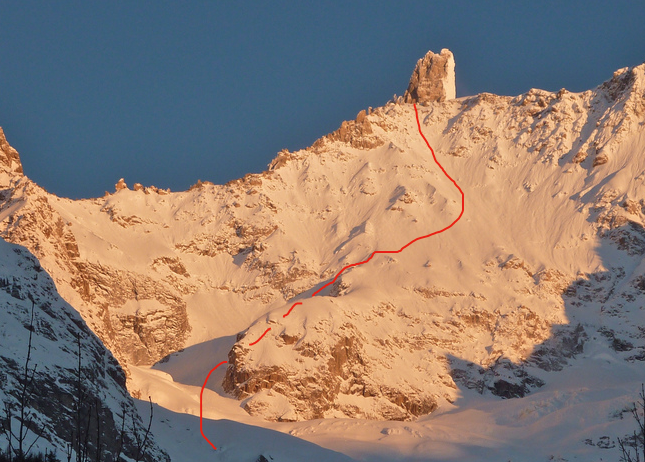 I had already skied its east face, south face and the Gervasutti Couloir so the only face left was the North! Heading towards it that morning with the intention of going solo I managed to convince my friend Ally Hurst to leave his group of four heading to the Diable and join me for some great snow. After he saw the face it didn’t take much convincing. We nervously crossed the big schrund on the Gerva and he stormed up the 350m couloir in 35 minutes. I was just behind with a chest infection, coughing my guts up in a time of 50 mins. Arriving back into the sun we took a look down the face. It still looked great, only 2 tracks and lots of good fresh snow to the sides. It was go time. Dropping straight in and making controlled turns in the great snow felt amazing and I was so happy and content skiing this big and exposed face. Arriving at the abseil after 10 or 15 minutes we clipped in. Knowing that the exposed top face was the only thing playing in the back of our minds. Once on to the lower face after abseiling our worries were behind us and we could ski care free down and over the schrund. Arriving back at Montenvers just after 1pm we both had grins from ear to ear. When Dave suggested this line I instantly became nervous. Even though I knew it was in good condition I had never skied anything this steep or this big before. With a toponeige grade of 5.4/5.5 E3 it is at the very upper end of skiable slopes. Known as one of the steepest sustained ice faces in the Alps it is not to be underestimated. I knew my ability could allow me to make turns on 50/55 degree slopes for short sections, usually cruxes on easier routes. This face would require me to make these controlled turns for over 700m of descent. We could see tracks coming from the top and they looked good. With no signs of big sloughs coming down we headed up with light bags after stashing our gear just over the bergschrund. There was some evidence of a bootpack still there but we (Dave) mostly had to make a new one. Half way up the slope we were joined by a lone Frenchman Boris, who accompanied us to the top and enjoyed the descent with us. Near the top you make a traverse to the right and into the sun. Reaching the col my nerves were peaking and I knew what I had to do to get back down safely. The first 100m was east facing and had a slight sun crust but still skied well. After the traverse back to the shady face the snow improved and so did the skiing. Making powder turns on 50+ degree slopes was a great feeling. Being in control and at the same time feeling madly out of control due to the location of the skiing, surrounded by towering faces and steep ice slopes. Once we jumped the schrund it all sank in. A big fist bump and pat on the back and you could see our smiles from Argentiere. A short trip to retrieve our gear then a fun and fast descent to Argentiere and a quick drive to work. It is amazing how good snow can turn even the steepest line in to a fun day out, I have skied the cosmiques on crusty ice and I felt a lot more gripped! Thanks Dave for the fun day and for suggesting this truly superb line.